ChangiWiFi is a personal wireless modem that connects any Wi-Fi-enabled devices to the internet with a secure network connection. Think of the Wi-Fi you have at home, just smaller in a pocket size version. You can connect your laptop, tablet and (or) mobile phone to the Internet while you are travelling overseas, anytime anywhere. Saving you from costly data roaming, Wi-Fi hunting and loads of prepaid SIM card credits. ChangiWiFi is pre-configured and does not require any complex installation. What can I do with this when I travel overseas? Share your travel adventures on social media channels! Why should I rent one? 24 hours convenience of collecting and returning in Singapore Changi Airport. 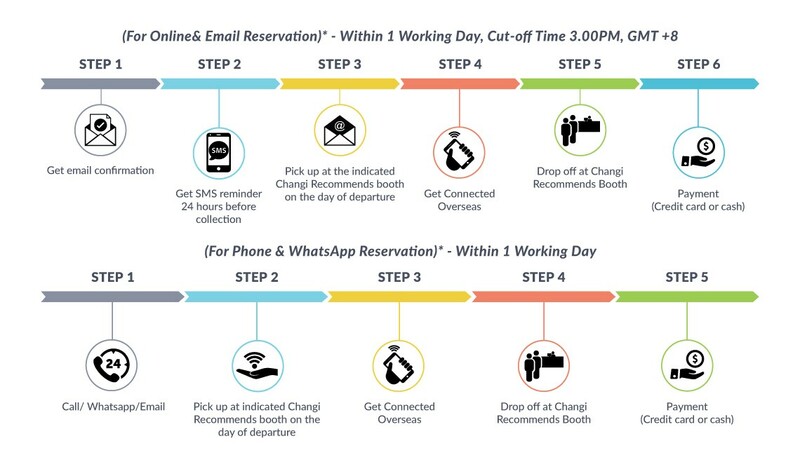 Means you can pick up before checking in your flight, get connected when you land and return when you arrive back to Singapore. Easy huh? Enjoy internet connection wherever you want. No more Wi-Fi hunting or depend on weak Wi-Fi in your hotel. Say goodbye to expensive roaming bills. No obligations during your reservation process, as you pay for the rent when you return. Surf the web on the go and keep your mind at ease with no hidden data fees. You can share the connection with up to 5 mobile devices (depending on the model of the router and country you are renting for). So, share Wi-Fi with your travel partners and go on an adventure! Can I just rent a Travel Wi-Fi router and insert my own overseas SIM card? Overseas Travel Wi-Fi routers are pre-configured by our dedicated operations team. You are unable to insert your own SIM card into the router, due to local data policies by the country’s local ISP to prevent abuse. That’s the beauty of the rent service – no installation, no configuration needed, just convenient and simple to use. What are the items I will receive when I collect ChangiWiFi? There are the charging cables, universal charger, and user manual to guide you on using the router and of course, the router itself! I am renting ChangiWiFi for China, can I use Google, Gmail, Google Maps, WhatsApp, Facebook, Instagram etc. during my stay there? The Chinese authorities have restricted the use of certain websites and mobile applications in China, however, you can access these websites and mobile applications if you opt to rent ChangiWiFi with VPN ($10 a day). What is ChangiWiFi’s Pay-Per-GB Plan? The Pay-Per-GB plan provides travellers looking to visit Europe and USA with an economical alternative by only paying for the data they consume during their trip. Up to 5 devices can be connected to the ChangiWiFi router at the same time. The Pay-Per-GB plan is created because Singaporeans tend to plan for longer holidays when visiting Europe and USA regions. The Standard plan, which charges by per day rental, will be costly for longer rental durations. Thus, the Pay-Per-GB plan was conceived to fill this gap in the market. Starting from $32 (for the first 2GB), the plan is currently available for Europe and USA with more countries to be added in 2019. What is the difference between the Pay-Per-GB plan and Standard Plan? The Pay-Per-GB Plan is charged based on data usage, starting from the basic price of $32 for 2GB. Should more data be required, optional top up is available at $20 per 1GB. Conversely, the Standard Plan’s rental rate is based on the number of calendar days the user has rented a ChangiWiFi router for. Rental starts from the date of collection until the date of return, with prices starting from $5 a day depending on the country the router has been rented for. For Pay-Per-GB Plan, the connection speed is also unaffected regardless of usage unlike the Standard Plan where Fair Use Policy may apply based on the country’s local carrier due to data congestion and abuse prevention. The Pay-Per-GB plan starts with a minimum of 2GB data at $32 for the entire trip regardless of rental period. Should you need require more data, the optional top up is available at $20 per 1GB. *The maximum rental duration for Pay-Per-GB plan rental is 15 days. What is the maximum duration I can rent ChangiWiFi’s Pay-Per-GB plan for? The maximum rental duration for Pay-Per-GB plan rental is 15 days. How can data top-ups be done? Upon collection of the ChangiWiFi router, the user will receive an SMS which will include a link to top up data and keep track of data usage. The minimum top-up will be $20 for 1GB. The top-up process will take no more than five (5) minutes to be reflected on the ChangiWiFi router. Payment will be made upon return of the device to Changi Recommends’ counter. How can I keep track of my data usage? Upon collection of your ChangiWiFi router, you will receive an SMS which will include a link where you can top up more data and keep track of data usage. Additionally, you will also receive constant email and SMS to prompts to top up once you hit 30%/70%/90% of your data usage. How can I make payment for the data topped up? Payment will be made upon return of the device to our Changi Recommends counter. Can I request for refund for unused data? No refunds will be issued for unused data. Can I switch from Pay-Per-GB plan to Standard Plan before the trip (vice-versa)? Yes, you can. Please reach out to our customer service team at least 3 working days before the date collection through either of these channels Call, WhatsApp or Email. Can I switch from Pay-Per-GB Plan to Standard Plan mid-trip (vice-versa)? No switching of plans will be allowed mid-trip. For unused data, can I bring it over to use it for my next trip? Unfortunately, you are not able to bring over any unused data. What is the network speed for Pay-Per-GB plan? In most destinations, the network will be in 4G. However, the network speed may differ as it is dependent on the local network carrier and infrastructures in the area you are in. Do note that rural areas, outskirts, mountains, underground tunnels and coastal areas tend to have weaker network. Connectivity may be intermittent at these areas and you may experience slower connection. For Pay-Per-GB Plan, the connection speed will not be affected by the Fair Data Use Policy (FUP) unaffected regardless of usage. Fair Use Policy only applies to the Standard Plan. Will Fair Data Use Policy (FUP) affect or implicate my usage? E.g. Malaysia and Indonesia has 500MB FUP guidelines, will the remaining of the 2GB be affected by it? For Pay-Per-GB Plan, the connection speed is unaffected regardless of usage. Fair Use Policy only applies to the Standard Plan. What happens to the network if 2GB is used up and I do not intend to top up? Users will not be able to access to internet as the pre-set data has been fully consumed. Email and SMS prompts will be sent to remind you to top up once you hit 30%/70%/90% of your data usage. If the user wishes to reactivate the plan (though a top up) after the data has been fully consumed, they will need to find an alternative internet source to access the top up page. Internet connectivity will return within five (5) minutes of successfully topping up. What happens if I forget to return the router or I return it late? The late return fee will only be implemented from the second extended day of the intended return date, at $1 per day, until the date the user returns the device to Changi Recommends. A 1-day grace period is extended for all users. How can I rent the Travel Wi-Fi for my upcoming trips? Reserve them anytime once you have the travel dates and destinations settled. We’d suggest advance reservation during the peak travel season. ChangiWifi are assigned on first come first serve basis, depending on the availability. Can I call or send a text message to reserve the ChangiWiFi? Yes, of course! We are all about making it convenient for you. Our call centre operates 24 hours so you can either call our customer service officers at +65 6701 1185 or WhatsApp message to +65 9134 1516 (General Inquiry) to reserve. Let us know the following details and your consent to receive the latest deals and offerings from us. I am travelling to a country that is not listed on the website, can I still rent a travel router? Countries that are not listed on the website are not available for rental. Fret not, we are working to cover ChangiWiFi to as many countries as we grow. Can I do last minute reservations? Last minute orders are at the mercy of routers' availability on first come first serve basis, depending on the country you are renting for too. Priority is given to travellers with advance reservation. To avoid disappointment, it is best to reserve early. What about the collection for last minute reservation? Yes, we do that too. Let us know by the cut-off time stated below so there is enough time for us to pack, arrange and send it to your departing terminal in the airport. You will get a confirmation email and a reminder SMS notification (to receive 24 hours before collection). This is subjected to router’s availability of the specific destination. WiFi device will be subjected to availability and is on a first come first serve basis. Kindly call +65 6701 1185 or WhatsApp +65 8403 4722 (24 Hours) to check on the walk-in devices’ availability. Reservations made before 1500 hrs for the following day collection will be confirmed by Changi Recommends. This is subjected to routers' availability of the specific destination. Example – reservation made on 1 Jan 1000 hrs for collection on 2 Jan 0900 hrs will be accepted. Note: All last-minute reservations depends on the routers’ availability for the specified destination. This is a rent service where charges are incurred for the number of days the user holds on the router instead of the data usage. The charges will incur from the collection day until the day it is returned to Changi Recommends. Charges begin from the first day of collection until the date the user arrives back to Singapore (Singapore date and time). For example, the travelling period to Japan is from 1 January (2200 hrs) to 7 January (0100 hrs). *The maximum rental duration for Pay-Per-GB plan is 15 days. You will be imposed on a per day late fee until the router returns to Changi Recommends. The rate will be as per the promotional rate you have rented for. For example, if the rental period is 1 January to 10 Jan for Japan at the rental rate of $5 a day, which will sum up to: $5 x 10 days = $50. If the user forgets and returns it on 12 Jan, the payable rental will be $5 x 12 days = $60 (additional 2 days). Late fee will accumulate from the second day of the intended return, at $1 a day, until the date the Customer returns the device to Changi Recommends. I am travelling to more than one country in a single trip, can I reserve for the router? Yes, you can. Choose either Asia Package, South East Asia Package, Multi-Europe or Worldwide plan depending where you are flying to. The rental cost is at SGD10/day. Charges begin from the collection day (Singapore date and time). For example, the travelling period to Japan is from 1 January (2200 hrs) to 7 January (0100 hrs). The rental cost is at SGD12/day (promotional rate). The rent rate for the first day on the collection date is waived. Charges begin from the 2nd day (Singapore date and time). For example, the travelling period to United Kingdom is from 1 January (2200 hrs) to 7 January (0100 hrs). The rental cost is at SGD17/day (promotional rate) covering your connectivity in the countries available in ChangiWiFi. The rent rate for the first day on the collection date is waived. Charges begin from the 2nd day of collection (Singapore date and time). For example, the travelling period to Japan is from 1 January (2200 hrs) to 7 January (0100 hrs). The rental cost is at SGD12/day. Charges begin from the collection day (Singapore date and time). There will be no change in pricing throughout the rental duration. For example, the travelling period is from 1 January (2200 hrs) to 7 January (0100 hrs). The rental cost is at SGD8/day. Charges begin from the collection day (Singapore date and time). There will be no change in pricing throughout the rental duration. For example, the travelling period is from 1 January (2200 hrs) to 7 January (0100 hrs). *The maximum rental duration for Pay-Per-GB plan rental 30 days. What happens if the router is missing, lost or damage? We have to replace a brand new set for the missing and (or) damaged one. There are two ways to this. Provide an official police report to us as an evidence of loss, damaged or theft. My travel plans have changed and I need to make changes in my reservation. How can I modify it? You may email to us at call@changirec.com to inform us of your changes. You may email to us at call@changirec.com or drop us a WhatsApp message to +65 9134 1516 (General Inquiry) to inform us of your changes. Where do I collect my ChangiWiFi? What are the required documents do I need to provide when I pick up the router from Changi Recommends? A passport that is used to reserve the router. For registration and verification purposes. A valid credit card. A refundable deposit of SGD$1 on the card is required as a hold for account validity and in the case of any incidental damage or loss of the rented items. Payment is made only when the router returns to Changi Recommends counter. Is there a user guide to guide me on connecting the router? Yes, the user guide is enclosed in every bag to help you getting connected overseas. Turn on Overseas Wi-Fi Router. Enable the Wi-Fi function on the mobile gadgets (mobile phones, tablets, laptop etc.). Choose the SSID name and enter the password on your mobile phone. SSID and password are indicated on the router. You are connected to Wi-Fi automatically when the hotspot is on. Note: Wi-Fi connection speed depends on the country’s network infrastructure. Will a non-4G mobile device be compatible to use on a 4G router? As long as the mobile device has Wi-Fi connectivity function, it is not a need to connect with a 4G mobile device. 4G connection refers to the speed the data is being transmitted for accessing the Internet. How many devices can I connect to the router at the same time? Depending on the model of the ChangiWiFi and the country you are renting for. On average, it lets you hook up to 5 mobile devices in a single time. What is the connectivity distance between the router and the mobile devices? What is the estimated battery life of a fully charged router? The average battery life is approximately five to eight hours, depending on the number of connecting mobile devices, data usage and radio wave condition. How can I troubleshoot if I face any issues with the router? Try to turn off the router and on it again. Otherwise, try to re-insert the SIM card and restart the router again. For travellers to China: Popular sites/apps such as Facebook, Google, Instagram, Twitter, WhatsApp and more are banned in China. To help skip past that, ChangiWiFi offers routers with VPN (Virtual Private Network). However, do note that the country’s authorities constantly update their network systems. As such, Changi Recommends will not be responsible for the VPN’s performance. For travellers to UAE: VoIP service providers such as WhatsApp, Viber, Facebook Messenger and SnapChat are banned. Unfortunately ChangWiFi does not provide VPN for the country and users will need to use their own VPN at their own risk. Do note that the country’s authorities constantly update their network systems. Fair Usage Policy is a set of guidelines implemented by the country's local carrier (Internet Service Provider, ISP) to limit the amount of data consumed by the end user. Once the estimated data cap is reached by the end user, the internet speed will either throttle to a slower speed (still accessible to the internet) or in some cases, terminated by the carrier. This is to prevent data abuse and violation of data service agreement, such as bandwidth hogging. Changi Recommends is not liable if the connection service is terminated when the end user has reached the given data limit. How do I know if the ChangiWiFi I rented for has data limit? There is usually an indication on the screen to show the amount of data consumed. Different models of the router have different ways of tracking the data consumed. Please check with our customer service for assistance. If data consumption exceeds its given capacity, you may experience either slower internet speed or termination/suspension of internet connection by the local ISP. How do I pay for my ChangiWiFi rental? Payment is done when you return the ChangiWiFi to Changi Recommends counters. We accept cash and major credit cards. The rental is chargeable from collection day until the day you return the router to us. The Pay-Per-GB plan is chargeable via data usage from a minimum starting of 2GB data and subsequent top ups made. Yes, we will require a S$1 deposit on your credit card when you collect the routers from us. This acts as an authorization hold in the case of incidentals. No actual charge is made on the credit card. The credit card issuing bank will release the deposit and the time taken to release will depend on the issuing bank. This is a refundable deposit and it will not be debited to the account. Where do I return the ChangiWiFi? You can return the router either directly to Changi Recommends.